Is BlackBerry Messenger Worth Something? BlackBerry Limited has several potential growth businesses waiting to be set free from the failing smartphone business. Since former Sybase chief John Chen took over for Thorsten Heins as CEO of BlackBerry Limited (NYSE:BB) in early November, shares of the fallen tech giant have stabilized in the high-single digit range. Chen has reorganized the company around 4 different business lines. These are 1) devices; 2) enterprise software and services; 3) QNX machine-to-machine technology; and 4) BlackBerry Messenger. Right now, the device business makes up the largest piece of BlackBerry's revenue, but this is arguably the least promising business unit in terms of growth opportunities. However, each of the other three could potentially be valuable growth businesses with the right strategy and good execution. Today, I'm going to zero in on the BlackBerry Messenger business, since social media companies have been in vogue with investors recently. 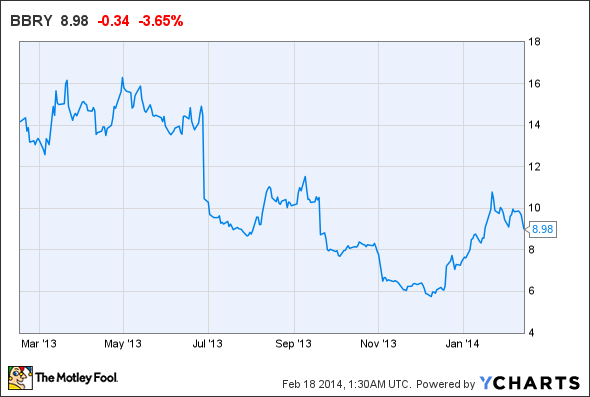 Could BBM create significant value for BlackBerry investors? Last year, BlackBerry made the controversial decision to open up BBM to iOS and Android by releasing it as a free app for those platforms. In the first two months of availability, more than 40 million iOS and Android users registered BBM accounts. This nearly doubled the global BBM user base! On the company's most recent earnings call, BlackBerry CEO Chen asserted that BBM still has very high user engagement. The service has 80 million active users on a monthly basis, with 60% of those using BBM daily for an average of around 90 minutes. Last week, BlackBerry rolled out a new version of BBM with a few important new features, such as free VOIP calls to BBM contacts for iOS and Android users, and Dropbox integration. New features like these should help BlackBerry continue attracting new users from the iOS and Android platforms. While adding new users and driving strong engagement are both critical to the success of any social media platform, in the end you need to be able to monetize that user base. Monetization of the BBM service is still very much a work in progress. Advertising is the most obvious possibility; for example, BlackBerry could charge companies for setting up BBM Channels to interact with their customers. BlackBerry's success (or lack thereof) in converting its large user base into a revenue stream will ultimately determine how valuable BBM is. However, the valuations of other messaging and social media firms suggest that BBM could be worth quite a lot. Just last week, messaging app Viber -- which has about 300 million registered users -- was acquired for $900 million. Viber's user base is strongly concentrated in developing countries, meaning that it may be worth significantly less on a per-user basis than BBM. Viber did not generate any revenue until last year, and its annual revenue is probably still a nominal amount. Meanwhile, Twitter (NYSE:TWTR) has a market cap of more than $20 billion, even though it has yet to earn a profit. Its high valuation can be attributed to its large user base -- it had 241 million average monthly active users as of the end of 2013 -- and its rapid growth. Twitter's revenue more than doubled in 2013, while its active user base grew 30% year-over-year. By contrast, all of BlackBerry is worth just $5 billion today. Even with its smaller user base, BBM's growth and its high user engagement statistics could make BBM worth more than $1 billion -- potentially much more -- if BlackBerry finds a good way to monetize the service. That would represent a significant portion of BlackBerry's total value. Due to the lack of a real revenue source within BlackBerry Messenger, BBM's value is purely speculative today. However, BlackBerry CEO John Chen is committed to building out the BBM service, and this means that it will remain a long-term growth opportunity. Other social media platforms have been valued at hundreds of millions or even billions of dollars, despite having similarly underdeveloped business plans. With BBM standing as just one of several potential growth businesses for BlackBerry, the main thing holding the company back is its ongoing losses from the device business. If BlackBerry can rein in those losses during its upcoming fiscal year, the stock could continue its rebound.